Enhance the Sound of Your Acoustic Drum Kit! 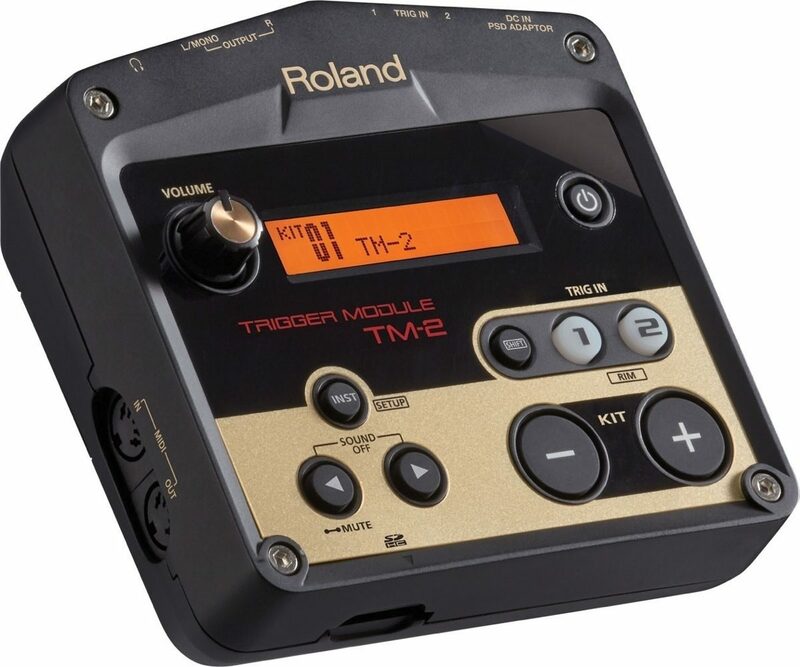 It's easy to add electronic sounds to your acoustic drums with the Roland TM-2 drum trigger module! With two trigger inputs that accept a range of Roland pads and triggers, and tons of onboard sounds -- plus an SDHC card for adding your own WAV samples -- the TM-2 module adds a whole new dimension to your drum kit -- no matter what genres you play. Layer the TM-2's wide range of percussion sounds and electronic instruments with those of your acoustic kit, and process sounds with 11 powerful multi-effects. MIDI I/O and your choice of battery- or AC-powered operation make it super-simple to incorporate electronic percussion into your acoustic setup. Dual trigger inputs let you connect two pads or trigger devices at the same time. If you're already equipped with Roland drumming gear, you can use just about any V-Drums pad -- including those that support dual triggering -- or RT-series acoustic drum triggers along with the TM-2. The compact trigger module offers a variety of acoustic sounds and tonal elements ready to layer on top of acoustic drums, no matter what your style is. Suitable for rock, pop, electro, and more, the TM-2's 100+ sounds and 99 kits are as versatile as can be. Traditional percussion instruments such as cowbell, wood block, and wind chimes take standard acoustic drum kits to new levels. If the module's onboard sound collection isn't enough for you, try stocking an SDHC card with your fave WAVs and triggering your own FX, loops, backing tracks, and processed drums directly from the card. The TM-2 conveniently sports an SDHC card slot for this very purpose. Use your own sounds alongside the TM-2's internal sounds, and process them all with the trigger module's built-in reverb, flanger, delay, and other multi-effects. MIDI I/O enables you to work with external devices. You can trigger sounds in V-Drums modules, keyboards, and synth modules; hook up a computer through a MIDI interface to record MIDI data and play your software samples; or play the TM-2's sounds from an external MIDI device. The TM-2 quickly becomes part of your acoustic kit, mounting easily onto a hi-hat stand or drum rack with standard hardware. Let the drum trigger module run on AA batteries when playing gigs or rehearsing, and plug in to AC power when practicing at home. 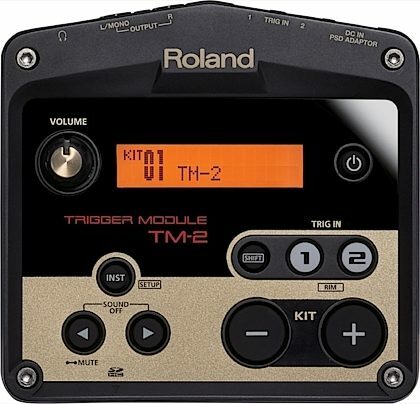 Compact and easy to use, Roland's TM-2 has large, straight-forward controls for assigning sounds to the trigger inputs and saving them as kits. 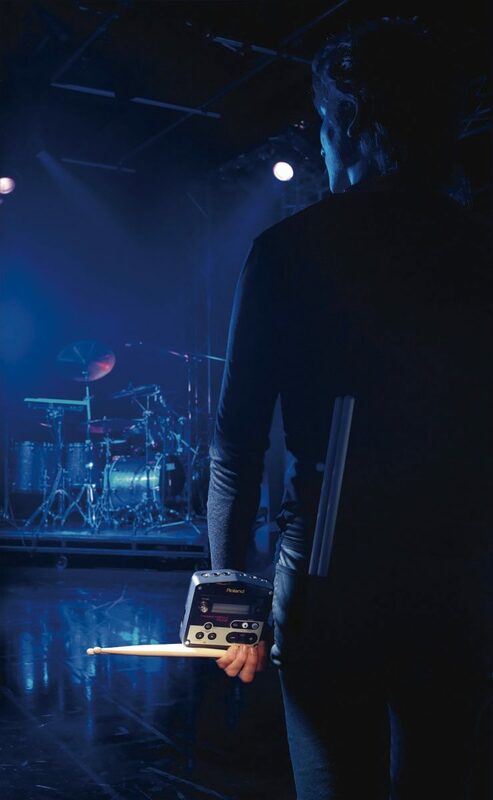 Battery powered and small in size, the Roland TM-2 Trigger Module provides a simple solution for enhancing acoustic drums with the creative versatility of electronic percussion. Two trigger inputs support a wide variety of pads and drum triggers from Roland, while the ready-to-play pro sounds are optimized for augmenting live acoustic drums and extending the percussion capabilities of any drum set. Studio-quality multi-effects are on tap to process your kits, and you can even trigger your own custom WAV sounds, loops, and backing tracks via an SDHC card. By combining the TM-2 with products such as Roland's BT-1 Bar Trigger Pad, KT-10 Kick Trigger Pedal, or RT-series acoustic drum triggers, it's never been easier or more affordable to create a powerful hybrid drum kit that blends acoustic and electronic elements together. 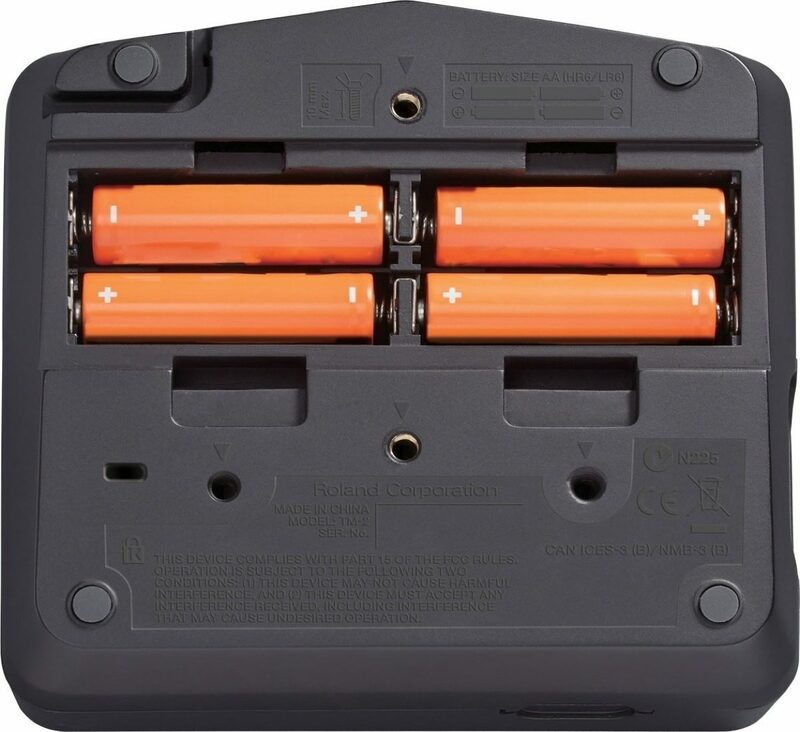 The TM-2 is equipped with trigger inputs for connecting two pads or trigger devices at once. Nearly any pad in Roland's extensive V-Drums lineup can be used, including those that support dual triggering. When building a hybrid kit, ideal partners for the TM-2 include the BT-1 Bar Trigger Pad, which has a curved shape that mounts onto the rim of an acoustic drum, and the KT-10 Kick Trigger Pedal, which features an innovative, all-in-one design and compact size that fits comfortably alongside other pedals in your kit. The TM-2 also works great with Roland's RT-series acoustic drum triggers that mount on kick, snare, and tom drums. 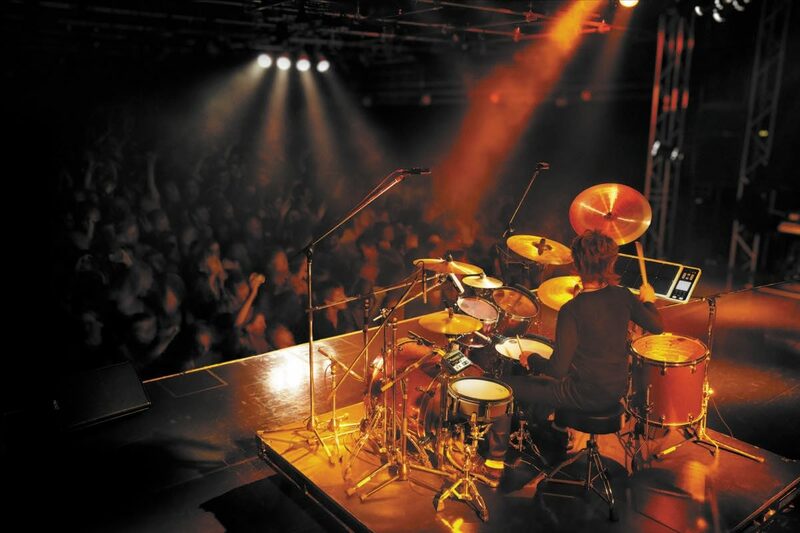 In top-level playing situations, professional drummers and sound engineers strive to create polished, high-impact sounds when amplifying live acoustic drums through a PA system. With the TM-2 and RT-series acoustic drum triggers, it's simple to achieve processed, concert-quality drum sounds wherever you play. The trigger module offers a wide range of acoustic sounds and tonal elements optimized for layering with acoustic drums, as well as a generous selection of electronic sounds for modern music styles. 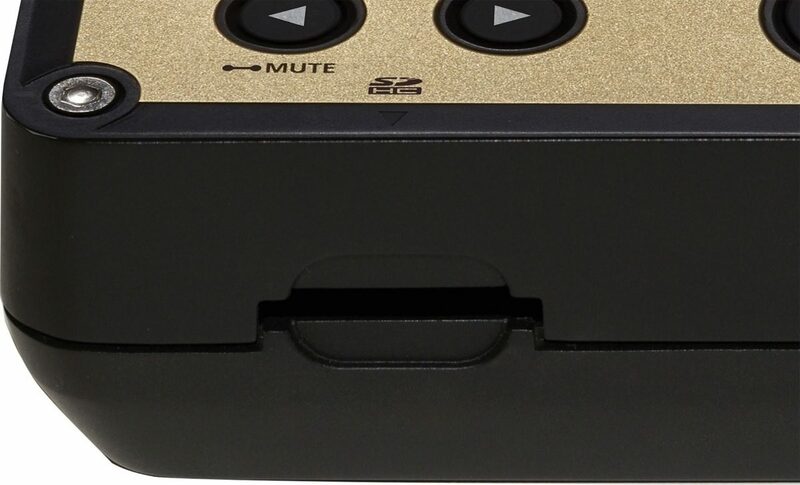 In addition, the TM-2's traditional percussion instruments such as cowbell, wood block, wind chimes, and others are perfect for extending the capabilities of any acoustic kit with a compact device such as the BT-1 Bar Trigger Pad. It's easy to use your own sounds with the TM-2, such as studio-processed drums from song recordings, sound effects, looped grooves, or even complete backing tracks. Just copy WAV audio files from your computer onto an SDHC card, and then insert it into the trigger module's card slot--that's it! You can use your own sounds right alongside the internal sounds as you build kits, which you can also process with the TM-2's great onboard multi-effects. MIDI I/O in the TM-2 allows you to greatly expand your electronic percussion setup with external devices. You can trigger sounds in V-Drums modules, keyboards, and synth modules, and connect to a computer via a MIDI interface to record MIDI data and play sounds in popular music software. It's also possible to play the TM-2's sounds--both internal sounds and WAV sounds stored on an SDHC card--from an external MIDI device. Overall: I got this module to enhance the sound of my kick for extreme metal drumming. I am using toe down double strokes for my double bass (similar to John Longstreth and Francesco Paoli). I am using the module with the Roland RT-30k kick trigger. It took some time reading the manual to adjusting the settings to fit the double stroke technique. Once I dialed in the right settings this thing is awesome! I still get the very rare misfire but I believe this has more to do with my old head and worn out beaters than the module. (I am also using a double pedal btw) There are two aptly named default trigger settings that suite metal, both have 'Metal' in the name to make it easy, lol. You can easily adjust the dynamics and pitch to alter the sound to your liking. I love the fact that it comes with a mount for the module that you can attach to a cymbal stand. Way easier than lugging around an entire rack case like the very popular Alesis DM5 unit. I have not tried the expansion slot yet as I am quite satisfied with the default samples. But I am sure I will try this feature eventually. The manufacturer documentation was a bit confusing to navigate. Mainly because it is in several different languages. Some of the instructions are not in a very logical order but they are still there. Roland has the manual as a downloadable PDF from their site. I would recommend downloading it on your smartphone for quite reference if you are playing a gig.